The Hinkley Quentin 6 light island chandelier in buckeye bronze finish features an angular form and geometric shapes within shapes. Featuring a rectangular ceiling mount, height adjustable twin rod suspension and long rectangular frame with rounded corners finished in buckeye bronze. The frame is made from two long inner rectangles and two squares on the outside. 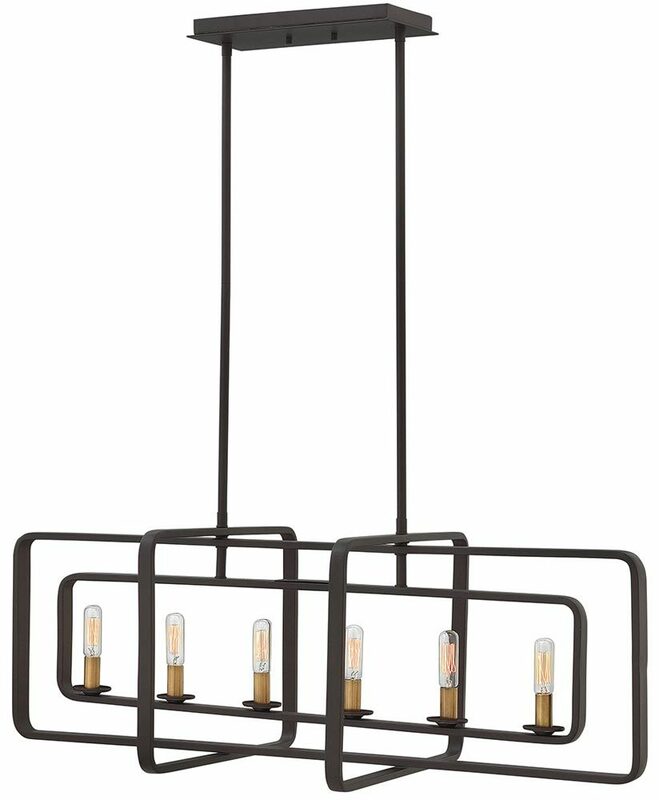 Six candle lights sit inside the frame, with candle pans and contrasting heritage brass finish candle tubes. Supplied with two 15cm and four 30cm rods that must be used in pairs and in any combination to achieve the desired drop; please see the technical information below for dimensions. Quentin is constructed of angular forms that create a striking geometric interplay. This stem-hung collection features intersecting rectangles in a bold buckeye bronze finish, forming a modern silhouette. Candle sleeves in Heritage Brass add a distinctively vintage feel that is both hip and historical. This on trend light is a contemporary take on classic vintage style, with more than a hint of our industrial past. It looks brilliant over a long dining table, kitchen island or breakfast bar or any other classic or contemporary themed room. 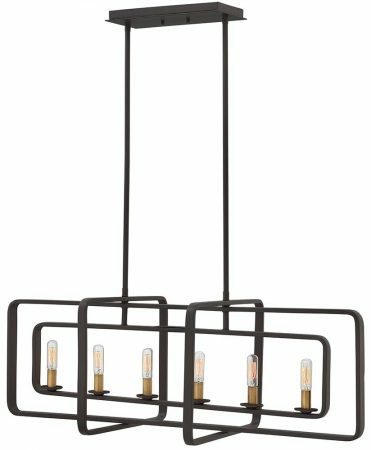 There are matching fittings available in the Quentin collection that includes a dual mount four-light and four-light pendant chandelier; please see below for the complete collection. This stylish light is supplied by Elstead Lighting and designed in the USA by Hinkley, founded in 1922 in Cleveland, Ohio. 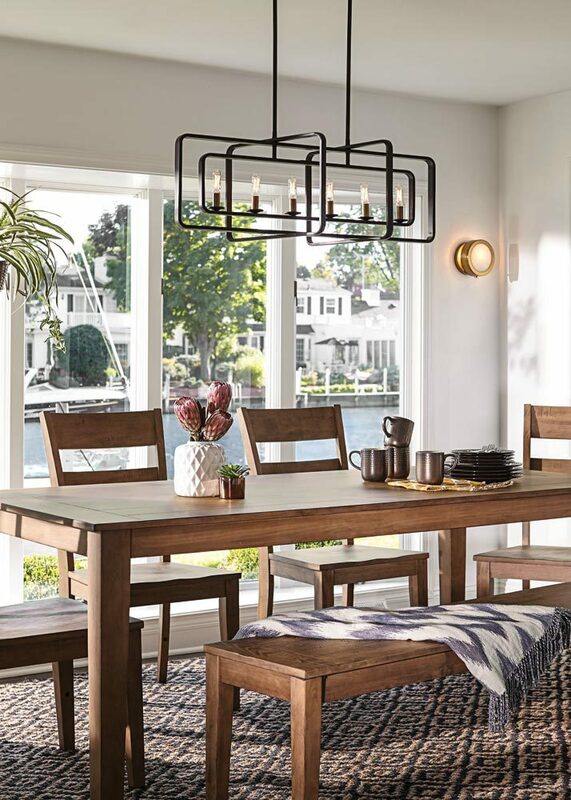 They have transformed from a small outdoor lantern company to a global brand intent on bringing you the best in style, quality and value designs like the Quentin 6 light island chandelier in buckeye bronze finish featured here.